Is It Ever Too Early to Start Learning Music? E-I-E-I- NO! When I first started leading music classes for toddlers, it was relatively rare. Usually it came about when a school where I was teaching older preschoolers and kindergarteners requested a music class for their very little ones. Now I see music classes for babies and toddlers everywhere – sometimes in a day care or preschool setting, sometimes in private music schools. It seems like everyone is hopping on this baby bandwagon. But is it really beneficial for babies and toddlers to attend music classes? All children have unlimited creative potential. Yet in my twenty years of teaching music enrichment classes to young children, I’ve noticed something. In almost every class, there’s one or two or three children who seem to be absolutely exploding with musicality. These are the ones who dance like dervishes at the slightest provocation, beat on the drum with confidence and enthusiasm, and sing along exuberantly – even when they don’t know the words! They make up their own words, or happily sing nonsense syllables without a trace of self-consciousness. Where does this kind of unstoppable creativity come from? DNA only builds the nuts and bolts of our minds, like Geppetto built Pinocchio – it takes a little fairy dust to bring real musical creativity to life. This fairy dust comes in the form of caring, involved teachers – one or a handful – who share their time, energy and imaginations. It’s never too early for children to enjoy the creative benefits of musical play. Even babies respond to bouncing rhymes, pat-a-cake,, and peek-a-boo. As they grow to be toddlers, teachers can make give galloping, rhythmic horsey rides, sing nursery rhymes while clapping to the beat, and dance and sing with puppets, stuffed animals, and simple dolls. They can get on the floor and look in toddlers’ eyes and be part of their playtime world. Toddlers don’t need brand names or TV characters to play with, or even CD’s (though some children’s entertainers are excellent). And when I first heard about smartphone apps with games for toddlers, I was appalled. There will be plenty of time to learn to press buttons for a quick fix of entertainment. What a growing, creative mind needs are loving, playful adults and instruments that support their developing musicality, such as drums, maracas, bells – even good old pots and pans. Music has been called “creative play with sound” (Brandt et al., 2012). The first of the senses to be fully developed is hearing, so music should be a part of life from the beginning. Sing every day and play all kinds of soothing, relaxing and fun music. 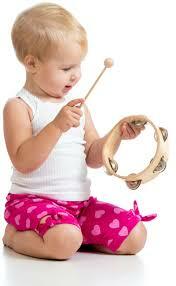 Older babies and toddlers will also love to play instruments with you. Studies show that making music with adults may help babies be more sensitive to music and more communicative in general (Gerry et al., 2012). And don’t forget to dance! Research indicates that infants “may be born with a predisposition to move rhythmically in response to music” (Zentner and Eerola, 2010). Sing and bounce babies on your knee, and when he can toddle, do the “toddler bounce” to your favorite tunes. Clap your hands, swing your arms. Watch how toddlers moves and copy them – it’s tremendously empowering for them to “lead the way.” Toddlers are also excited and engaged by dancing with their favorite stuffed animals or (soft) baby dolls. Simple props such as hats and scarves can also add to the fun. Dancing is a natural, age-appropriate way to work off some of that toddler energy and express thoughts and feelings creatively. When it comes to musical creativity, a good rule of thumb: “If it isn’t fun, don’t do it.” Be observant. If toddlers look uninterested or they’re getting tired, stop and move on to something else. This may be after two minutes or twenty, depending on the day and the toddlers’ mood. And remember, it’s all about the process, not the product. Go easy on the praise, the compliments, the “good job!”s and the “oohs” and “aahs.” The goal isn’t for toddlers to perform at Carnegie Hall. It’s to introduce them to the sheer joy of using their minds and bodies to sing, dance, play, imagine, pretend, and create music. Zentner, Marcel, Tuomas Eerola. Rhythmic engagement with music in infancy. Proceedings of the National Academy of Sciences, 2010. This entry was posted in Uncategorized and tagged early childhod music, preschool, toddlers. Bookmark the permalink. « Breaking News: Animals Get Stuck in Gum!